Becoming a landlord has been an attractive proposition for anyone who could raise a deposit, thanks to a prolonged period of low borrowing costs and generally rising property values. However, interest rates have finally started to rise (they are now the highest they have been for nearly a decade) and uncertainty in the housing market has reduced property prices, particularly across London and the south-East. Despite these negatives, becoming a landlord may still be an appealing option given the perceived lack of good alternatives, with savings rates remaining low and restrictions on the amount that can be saved into a pension. Recent tax changes, tighter lending rules and two bank base rate increases since November 2017 have had a negative impact on the buy-to-let market. This means that anyone thinking of becoming a landlord in future will need to carefully consider the pros and cons, especially when it comes to tax. While finding the right property in the right area at the right price will be at the forefront of your mind, you should not forget the tax implications. Although you will incur various lending, legal and survey costs, stamp duty land tax (SDLT) is usually the biggest expense when purchasing a property in England or Northern Ireland. 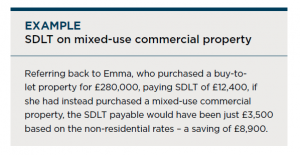 SDLT rates are increased by 3% when it comes to buy-to-lets, regardless of whether you buy the property personally or through a limited company. If you are purchasing a buy-to-let in Scotland, you will pay land and buildings transaction tax (LBTT), instead of SDLT, at a rate of 4% from 25 January 2019. For buy-to-let purchases in Wales, land transaction tax (LTT) applies with a 3% surcharge, as in England and Northern Ireland. In each case, tax is paid on the slice of the purchase price falling within each tax band. 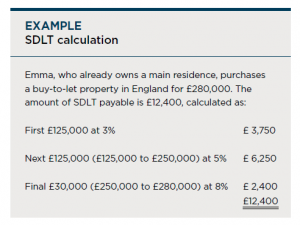 The surcharge is not charged on a property costing £40,000 or less, meaning no SDLT, LBTT or LTT will be charged for such a purchase. As a general rule, living in a property before letting it out will not get around the surcharge. The only situation where the surcharge will not apply is when your buy-to-let purchase is your only property, such as where you are personally living in rented accommodation. Planning point – SDLT, LBTT and LTT are not payable on any part of the purchase price that is attributable to such things as carpets, curtains and any other moveable furniture and domestic appliances that the vendor leaves in the property, so a modest reduction in the amount of tax payable may be possible. An important decision that you will have to make at the outset is whether to purchase your buy-to-let property personally or through a limited company. The restriction to the tax deductibility of finance costs (explained below) has made the company route more attractive. The low rate of corporation tax (currently 19%, falling to 17% from April 2020) also means this option makes sense if you are aiming to retain profits for reinvestment in additional property or to repay some of your financing. A company structure makes it relatively easy to include family members in your property business, and control can gradually be passed to children or grandchildren which makes for good inheritance tax (IHT) planning. However, the overall tax charge might well be higher if profits are withdrawn from a company. If taken as remuneration, national insurance contributions could be payable. 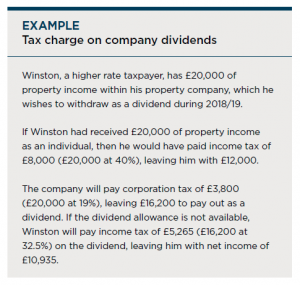 If extracted as dividends, there could be a double charge to tax if the dividends are over the £2,000 tax-free dividend allowance. Capital gains may also suffer a double tax charge. Tax relief for an individual’s finance costs, such as interest on mortgages and loans to furnish a property, is to be replaced with a basic rate relief tax reduction. This change is being phased in over four years, with 50% of finance costs allowable against rental income for 2018/19, dropping to 25% for 2019/20, and thereafter no finance costs will be deductible. The change in tax relief for finance costs also affects the amount that you can borrow. Affordability tests applied by lenders take account of the tax that you will have to pay on property income, which could be higher given the restriction if you pay tax at more than the basic rate. Lenders will probably require rental income to be 145% of your finance costs if you are a higher rate taxpayer, compared to the previous level of 125%. Borrowing at the 125% level should still be possible, if using a limited company or if you just pay tax at the basic rate. Planning point – If buying a leasehold property, check that the ground rent is not excessive. The recent use of high, escalating, ground rents, can seriously impact on the future value of the property and, in some cases, make it unsaleable. The basis for taxing property income used to be simple, but this is no longer the case following recent tax changes. For individuals, property income is calculated on a tax year basis, with accounts being prepared to 5 April (31 March is permitted). Income and expenses for all your buy-to-let properties are pooled together, with figures normally calculated on a cash basis. Rent and expenses are therefore included when received or paid. For companies, property income is calculated according to the company’s accounting period and must be done on an accruals basis. Cost of maintenance, repairs and gardening. Council tax, water rates, gas and electricity. Business mileage calculated using HMRC’s mileage rates (45p per mile up to 10,000 miles, and 25p thereafter) or based on the actual cost. You can also deduct any amounts spent on replacing furniture and furnishings, including beds, televisions, fridges and freezers, carpets and floor coverings, curtains, and crockery and cutlery. However, there is no relief for the initial cost of furniture and furnishings. The amount of relief is reduced by any proceeds from selling the old asset which has been replaced. Also, relief is not given for any cost which represents an improvement, for example: if a washing machine is replaced with a washer-dryer, only the cost of an equivalent washing machine qualifies for relief. However, this rule is relaxed if the improvement element is incidental, such as replacing single- glazed windows with the modern equivalent of double-glazed windows. An annual property allowance of £1,000 can be claimed as a deduction by individuals if this is more than your actual allowable deductions and reliefs. Planning point – Unless you are using a letting agent, make sure that you check the right to rent of all new tenants aged 18 or over, even if they are not named on the tenancy agreement. You will need to ask for, and keep copies of, original document proving that tenants are permitted to live in the UK. Many landlords are unaware of their tax responsibilities. HM Revenue & Customs has been running a let property campaign for several years and has published examples of errors made by landlords. You might not even think of yourself as a landlord. This could be because you’ve inherited a property, just rented out a property to cover your mortgage payments, or moved in with someone and have therefore had to rent out your house. None of these are a reason for not correctly calculating and declaring property income. Agent or not? The first is whether to use a letting agent or run things yourself. A good agent will be invaluable when it comes to finding tenants (and filtering out bad ones) and ensuring that tenancy agreements are watertight. They will be up to date with property legislation (especially fire safety), take much of the stress out of maintenance and provide an impartial buffer should the tenancy go sour. However, lettings agents are not cheap, so one popular option is to just use an agent to find and vet tenants, and to set up the tenancy. Multiple occupancy The second is the need to be aware of the additional requirements if you rent out your property as a house with multiple occupancy (an HMO). This is a complex area, but essentially multiple occupancy means at least three tenants, forming more than one household, but who share facilities like a bathroom. Student lets will normally be classed as HMOs. Planning point – It can make sense to retain existing tenants by foregoing rent increases. Apart from the cost of finding a new tenant, there is generally no discount from council tax for empty properties. Your buy-to-let property portfolio may increase in both size and value, and at some point you may want to cash in some properties, possibly to pay down the finance on those to be retained. Another option as you get older might be to gift some properties to your children or grandchildren. Capital gains tax (CGT) will come into play whether you sell or gift property, although this tax can be avoided by simply retaining property until your death. Your children or grandchildren can then inherit properties with an uplifted base cost for CGT purposes, although IHT then becomes an issue. CGT: The gain will be based on what you sell a property for, or its market value if You can deduct the original purchase cost, incidental costs of purchase and sale (such as legal fees and stamp duties) and any expenditure which has enhanced the value of the property (and will therefore not have been deducted as repair expenditure when calculating property income). After deducting any available annual exempt amount (currently £11,700), gains will sit on top of your income for the tax year of sale or disposal. Any part of the gain that falls within your basic rate band will be taxed at 18%, with the remainder taxed at 28%. IHT: Outright gifts of property have IHT implications if you die within seven years of making the If your property portfolio is retained until death, it will be included as part of your estate at its value at the time of death. 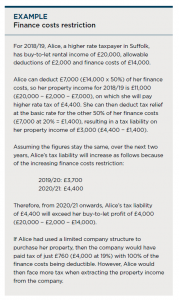 Basically, IHT is payable at 40% once a nil rate band of £325,000 (up to £650,000 if you benefit from the nil rate band of a deceased spouse or civil partner) is exceeded. If you have used a company structure for your buy-to-lets, then any gains will be made within the company and taxed at the 19% company tax rate. But note that companies do not benefit from the annual exempt amount. The base cost of any property disposal is uplifted by an indexation allowance, which allows for the impact of inflation, as measured by the retail prices index (RPI). However, indexation has been frozen at December 2017, so no relief is given for inflationary gains from January 2018 onwards. Properties acquired on or after 1 January 2018 will not benefit from indexation. Should you wish to extract the proceeds of a company property disposal, you will face a potential double tax charge – the corporation tax payable on the gain, then personal tax on the withdrawn proceeds – which is inefficient compared to the tax cost of disposing of a personally owned property. For gifts during lifetime or on death, the relevant asset will be the company’s shares rather than the underlying property assets. The value of the company’s shares will be included in your estate on death, with no uplift to the base cost of the property held within the company. IHT business relief does not generally apply to property company shares. The introduction of the finance costs restriction for buy-to-lets has spurred interest in other types of property letting which do not suffer the same restriction. Furnished holiday lettings are treated as a trade and therefore qualify for various tax advantages, although they will obviously require considerably more work given the short-term nature of the lettings. Apart from not suffering from the finance costs restriction when calculating property income, any gain on the disposal of a furnished holiday letting can benefit from a 10% capital gains tax rate. However, the qualifying conditions can be hard to meet. Essentially, a property must be available for letting at least 210 days a year and let for at least 105 days. You might not like the idea of commercial property, but semi-commercial property, such as where there is a flat above a shop, might be an attractive proposition, being halfway between commercial and residential investment. The purchase of such a mixed-use property will not suffer the relevant stamp duty surcharge, and the finance costs restriction will not apply to those finance costs associated with the purchase of the commercial element of the property. A new relief provides for an annual 2% write-off if you buy commercial property where the construction contract was signed on or after 29 October 2018. The cost of converting or renovating an existing property also attracts the 2% relief, but the value of land and any dwelling element are excluded. The rental yield from mixed-use commercial property is often significantly higher than that from a traditional buy-to-let. Do not overlook the tax advantage of renting out a furnished room or rooms in your own home, especially if to a long-term lodger. Rents of up to £7,500 each tax year are exempt from tax, which will be quite beneficial for a higher rate taxpayer. The relief does not apply, however, if you have converted part of your home into a separate flat. You can either rent to a long-term lodger or make use of an online site such as Airbnb to offer holiday lets. Don’t forget to inform your mortgage lender, review insurance cover and check whether there are any local authority restrictions. Planning point – Consider renting out a furnished room (or rooms) in your own home. Rents of up to £7,500 each tax year are exempt from tax. We can help you to understand the tax implications prior to you purchasing a property, and the effects of using corporate structures. We can help you understand what a sale will cost in tax terms. We can also discuss estate planning options that can help keep IHT liabilities to a minimum. There have recently been several important changes to the way in which property income is taxed. We can also keep you up to date with any further changes. Investing in property should be regarded as a long- term investment and should fit in with your overall attitude to risk and financial circumstances. Past performance is not a reliable indicator of future performance and you may not get back the original amount invested. The value of investments and income from them can go down as well as up. Levels and bases of, and reliefs from, taxation are subject to change and the value of tax reliefs depend on your individual circumstances. The Financial Conduct Authority does not regulate tax and certain forms of estate planning. This publication is for general information and is not intended to be advice to any specific person. You are recommended to seek competent professional advice before taking or refraining from taking any action on the basis of the contents of this publication. The Financial Conduct Authority (FCA) does not regulate tax advice, so it is outside the investment protection rules of the Financial Services and Markets Act and the Financial Services Compensation Scheme. This publication represents our understanding of law and HM Revenue & Customs practice as at 30 November 2018.